You might be more familiar with posts of the ‘Why I’m No Longer Vegan’, or ‘Why I Eat Meat Now’ variety, and my post may seem obvious to a lot of you who’ve been following my blog since I decided to go vegan just over 2 years ago (I still ate Greek yogurt on occasion for a few months following that post, though). However, I mentioned in a recent post that I had been experimenting with eggs lately. I bought organic liquid egg whites 2 weeks ago and local, free range whole eggs this past weekend. I used both in a few recipes, namely some coconut flour flatbread and some chocolate protein pancakes, as well as some failed experiments like plantain donuts. I liked the way the eggs worked with coconut flour (it’s a finicky flour, and doesn’t always hold together well with vegan egg replacers) but that was where the benefits ended. For starters, I wasn’t fond of the taste or texture of either the egg whites or the whole eggs in things. They made everything so moist (I prefer things like pancakes and breads dry), and I could definitely detect an eggy aftertaste, even with the whole eggs. I wanted to like the local eggs, because I like how the hens were raised and the fact that these were produced near me, but I just didn’t. To be fair, the whole eggs did taste more mild and less eggy than the whites, but they didn’t make the texture of things any better. More than that, though, my body rejected the eggs. Ever since I reintroduced eggs (somewhat when I bought paleo bread 3 weeks ago–made with egg whites–but more so when I used the egg whites/eggs), my acne’s been flaring up, without any other changes to my diet or facial routine. My usual tea tree oil remedy hasn’t been helping at all, and it’s been hurting my self-esteem to have this awful acne, especially in places where I rarely get it, like on my cheeks and chin. And, I noticed after I had the protein pancakes made with a whole egg that my stomach was really off. Total TMI, but I had bathroom issues and gas for a lot of the afternoon after eating it. Also, my energy’s been lower than usual since I reintroduced eggs. I haven’t even been eating a lot of them, probably 1 per day at most, but it’s just thrown off my energy levels, my digestive system and my facial oil production. 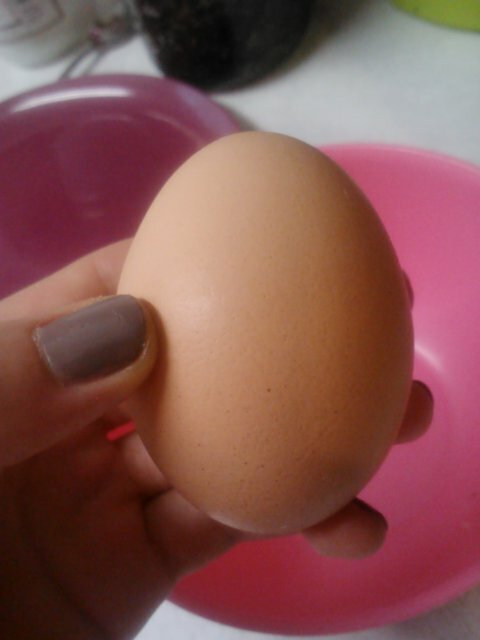 Cute lil egg. Didn’t work for me though. Let me be honest, I really wanted eggs to work for me. I know that eggs are basically a superfood, with all sorts of health benefits, not to mention a great source of vegetarian protein. I’ve literally never been a fan of eggs since I was little–I always hated the texture and taste–so I rarely ate eggs growing up, aside from when they were baked into desserts. I wanted to try them again to see if my tastebuds had changed, and I was excited to experiment with recipes I’ve never been able to try because they rely on eggs. However, I think my body is telling me that it does NOT want me eating eggs, and I need to respect that. I think it’s very possible that I developed an intolerance or sensitivity to eggs, since it’s been so long since I’ve consumed them in any form, let alone as the main component of a dish. These looked and smelled good, but they didn’t taste great…or make me feel great. So what does the failed egg experiment mean for me? It means I’m returning to veganism. Veganism for me does mean consuming raw honey on occasion, but other than that, I’m 100% plant based. I want to go back to eating more fresh produce (I still do that, but I want to keep it up), mostly beans and legumes for protein along with raw protein powders and sticking with a high raw approach to veganism (with plenty of raw fats from avocados/coconut/nuts). I was following this for most of the summer, and I had so much energy, my skin was clear and my digestion was great for the most part. I’m a true believer in different things working for different people, and I want to make it clear that just because eggs didn’t work for me doesn’t mean they aren’t a beneficial food. If you like eggs, and they make you feel good, more power to ya. I think my body just wants to stick with a vegan diet for now, and I’m choosing to listen to that! 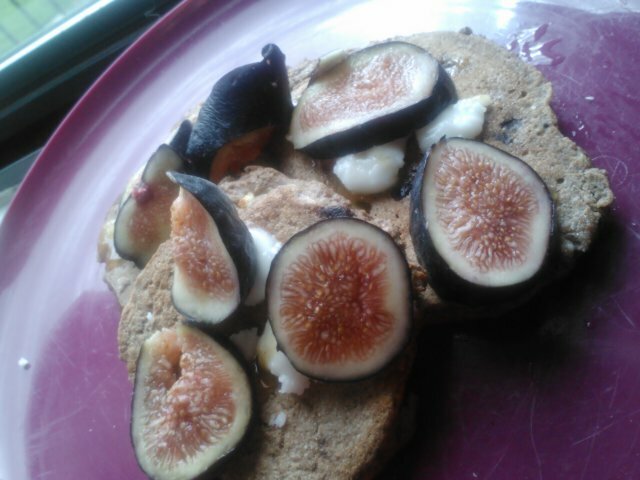 I’m going back to eating more of this, and less of what doesn’t agree with my body (recipe to come soon). I also want to mention that I’m not using this failed experiment as a way to be restrictive. I’ve finally moved away from calorie/macro counting, I’ve been actively trying to eat more to fuel my daily workouts and busy school schedule, and I’ve been getting better about not being so rigid with my eating routine. I’ve also been feeling less guilt over missed workouts, and going out to eat. My family’s coming up to visit me this weekend, and I know we’ll be eating out a couple times. I’m actually really looking forward to it, because I’ve missed my favorite vegan-friendly restaurants and it’ll be nice to get a break from cooking for myself. Basically, going back to veganism doesn’t mean I’m being stricter, it’s just me listening to my body’s cues! Have you ever experienced negative effects from eating a certain food? It seems like Easter was weeks ago, but nope, it was just a couple of days ago! Obviously I’m great at procrastinating on posting about it 😉 But seriously though, it’s getting to be that busy time of the semester, when everything is just starting to pile up so apologies if I go missing around here for a few days! Easter weekend was one of the best weekends I’ve had in awhile. I really needed the long weekend after a rough post-spring break week back at school, so the fun and rest was much appreciated. I’ll break it all down for you in some pics I snapped over the weekend. 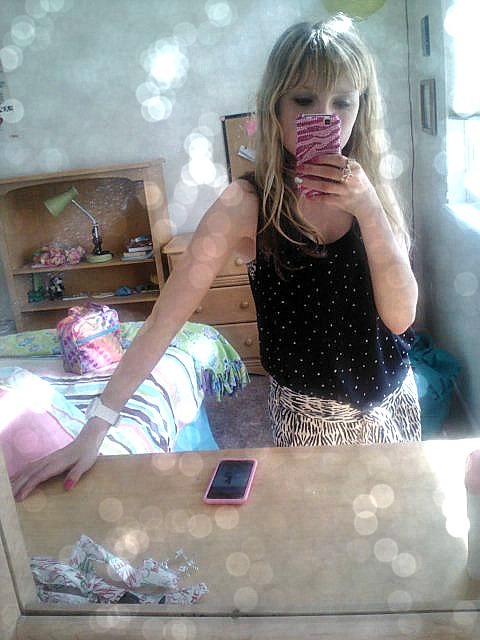 OOTD March 28: black studded tank (F21), black/white printed harem pants (F21), white watch (AE). Thursday started out with morning classes, and then my mom drove up to bring me back home. She got up to my apartment around noon so we stopped for lunch before hitting the road. We went to Wahoo’s, one of our old favorites that we now can’t get back home since all the locations shut down. Luckily my college town still has one–Wahoo’s has the best guac, hands down. I got a surprisingly amazing salad topped with guac, salsa and roasted veggies. Fast forward a couple of hours. My parents were both in a Holy Week play at our church so my sister and I went to go watch them. For not having many rehearsals, everybody was really good and a lot of the monologues were very emotional. Friday morning I got to sleep in a little, and then after lunch my mom and I went out to find birthday presents for my dad. Shhhh, don’t tell him I told you but he’s turning the big 5-0 today! 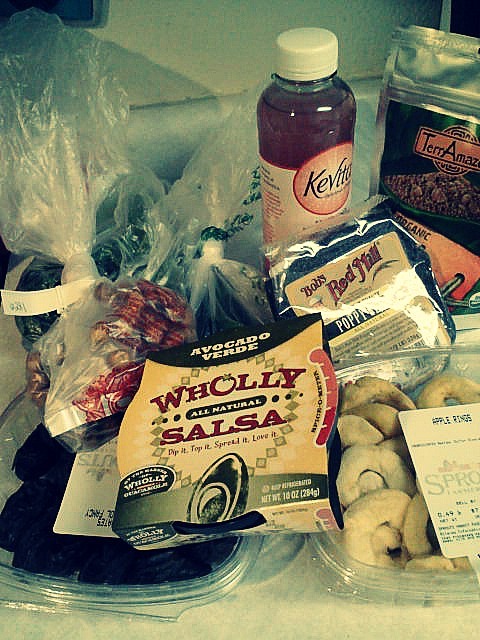 Anyways, we also hit up Whole Foods as per usual so I could pick up groceries for the week ahead. I got a few new things as usual too–the Sunwarrior chocolate was ordered by my dad off Amazon, but everything else was bought by me. So far, I loved the sweet potato apple fruit strip–it was delicious and only a couple of grams of sugar–the nori sheets (perfect for raw wraps) and the kale chips. Seriously, the Kale Krunch brand is the best, I’ve loved all their flavors I’ve tried. Artisan pizza to celebrate my dad’s birthday a little early. This was Saturday’s leftover dinner (over a bed of spinach+balsamic) but I ordered a pizza with kalamata olives, artichokes, capers, garlic and oregano (no cheese of course). This may seem weird as a clean eating vegan, but I LOVE pizza! By pizza, I don’t mean mass-produced Domino’s or frozen pizza with greasy cheese and no veggies. I love good quality, hand tossed pizza from authentic restaurants topped with classic Mediterranean toppings like olives and artichokes and thin crispy crust. And of course, no cheese! Even when places offer vegan cheese, I never order it because I like to keep my pizzas focused on the veggies. We ate dinner pretty late since we went to the Good Friday service at our church before (always a very moving service) but surprisingly, I wasn’t too freaked out about eating dinner around 9. 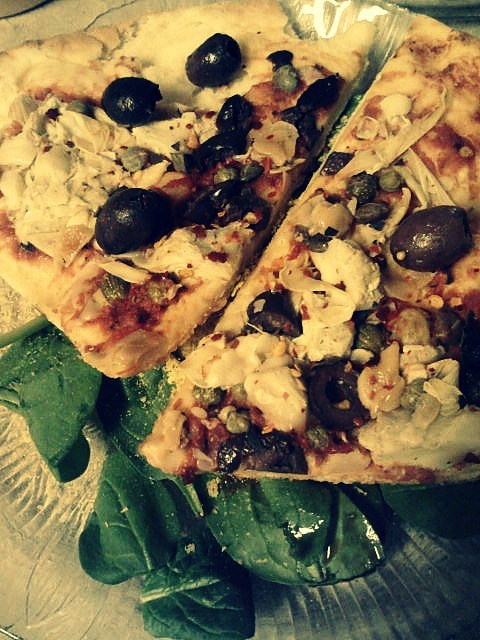 I even ate 4 out of 6 of the slices…and had two leftover for a great dinner on Saturday! My diva Easter eggs, thanks to a Target egg kit. Who needs to dye eggs when you can accessorize them? At my house, we’ve decorated Easter eggs since I was little and I can’t imagine not doing it. This year, I convinced my mom to buy the diva decorating kit from Target rather than the usual glitter and dye kits. 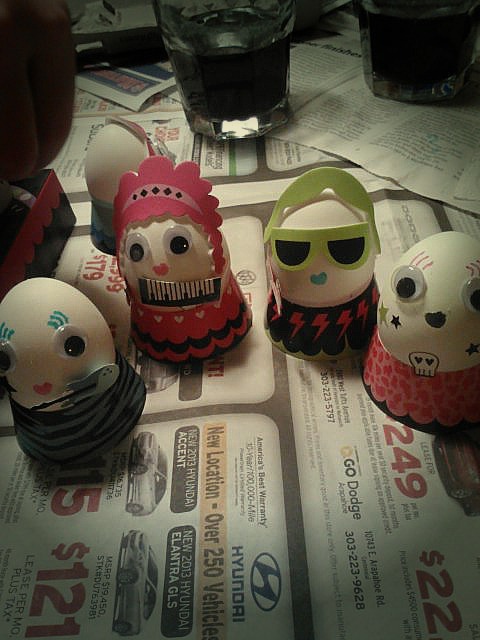 Yes, I’m still 5 years old 😀 My sister and I had a blast glamming out our eggs to be rocker chicks on Saturday night. Easter eggs have never been this cool! Grain free carrot cake pancakes for Easter breakfast. What’s better than homemade pancakes on Easter morning? Ok, for me, waffles would win, but my waffle maker lives at my apartment while I’m at school so sadly I couldn’t make them. 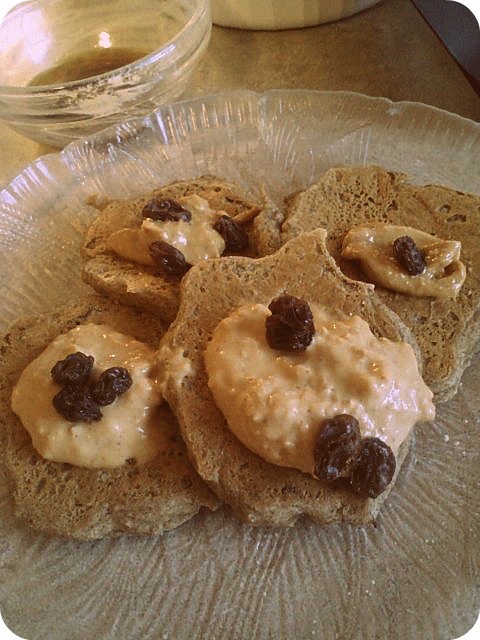 But I settled for carrot cake pancakes, made with almond and buckwheat flours (so technically grain free, since buckwheat is a seed, like quinoa), shredded carrot, raisins and topped with peanut flour paste and cashew butter and more raisins, dipped in real maple syrup. If only I could make pancakes every morning! 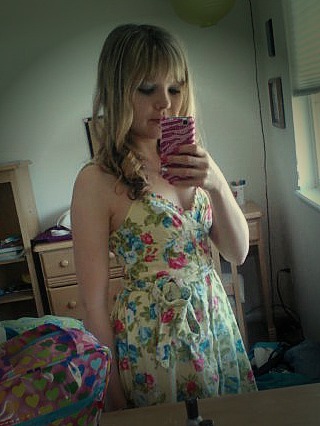 I didn’t realize it until looking at my photos from last year, but I wore the same dress last Easter. Oh well, I’m sure no one but me noticed. Easter is usually snowy and cold here for some reason (April is one of our snowiest months, go figure) but this year we had no snow at all and it was actually sunny and in the 60s. So I could wear a dress without bundling up in a coat and sweater too! 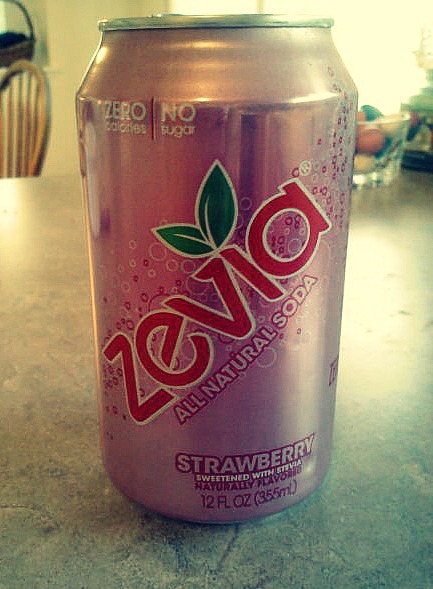 Finally tried the strawberry Zevia! Sprouts is my savior…first they had the ALT Larabars, now they have strawberry Zevia. And unlike the grape, which I only sorta liked, this one was delicious and almost tasted like watermelon (always a good thing). And I just love the light pink can color! Another Easter tradition that never gets old? Hiding Easter baskets! My mom hid one for me, my sister and dad this year and I still loved searching all over the house for it. 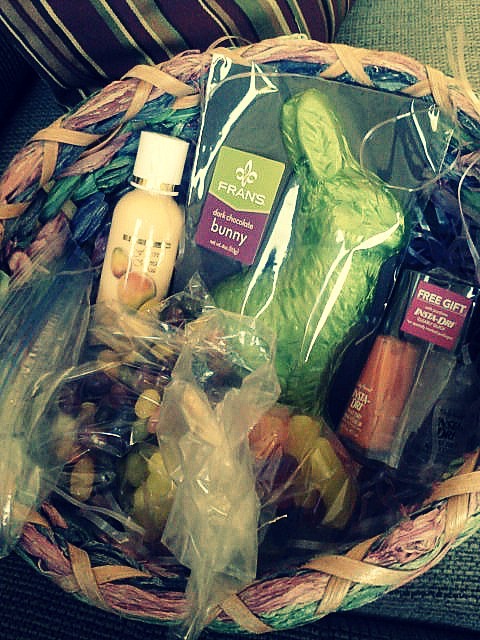 And I was pleasantly surprised to find that she had filled it with my favorite nail polish color, great smelling lotion and vegan candy from Whole Foods. Now, to be 100% honest, I’m still a little wary about this candy–it’s healthier than most but it still doesn’t have completely ‘clean’ ingredients up to my ridiculous standards. However, I know she wanted me to be able to enjoy some candy, so I’ll try to get over my fear and enjoy a little of it every day. It’s not even that unhealthy, to be honest, just another issue I’m still dealing with. 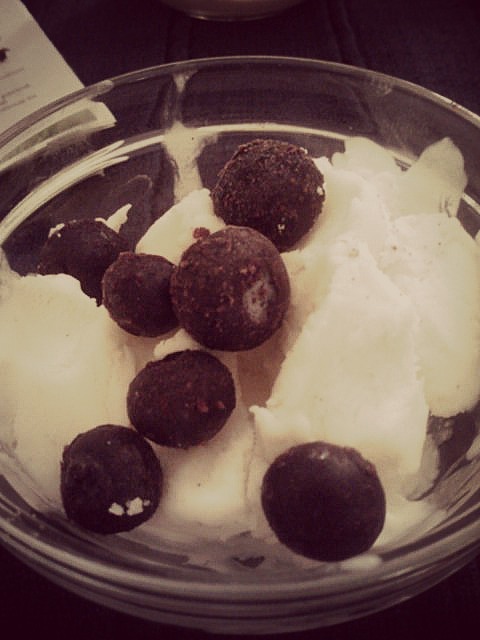 So Delicious sugar free vanilla coconut milk ice cream topped with frozen blueberries. Easter dessert was something I haven’t had in awhile–ice cream! I love coconut milk ice cream, but again, it was something I pushed aside because it wasn’t totally ‘clean’. However, I really like the no sugar added kind by So Delicious and it’s really not that processed so I enjoyed a small bowl of the vanilla with blueberries and a homemade chocolate PB bunny on the side (recipe to come). Easter weekend was extra long because I didn’t head back up to school until early Monday morning. Once back at my apartment after classes, I whipped up another batch of the homemade chocolate PB bunnies (this time I made ‘eggs’) and also experimented with making a carrot cake inspired version. Both kinds turned out amazing, so look for those recipes very soon! Both recipes have no added sugar, and are super easy to whip up. What was the best part of your weekend? Are you a snob about any foods (like me with pizza)? 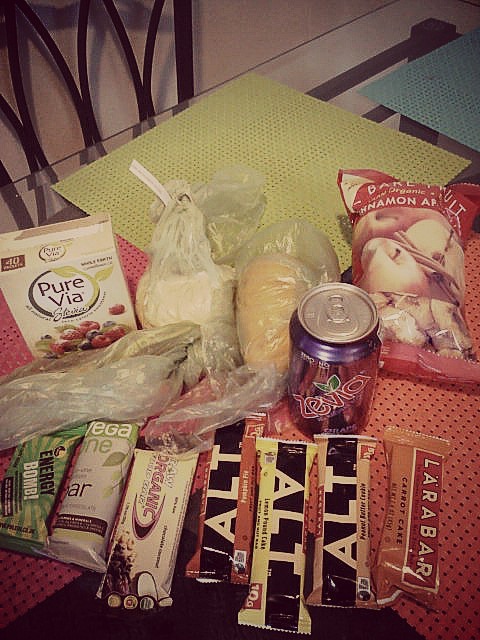 A series of posts on one college girl’s trials and errors in budgeting her grocery money and still eating well. I can’t believe it’s been almost a month since my last CVB post! Don’t worry, I’ve definitely still been buying groceries since then, I just haven’t had too many exciting purchases. Until this week, that is. As I mentioned in my WIAW post this week, I’ve been enjoying a lot of new-to-me products this week. Other than the ones I already mentioned, I just got my latest iHerb order in the mail and other than my usual peanut flour and Alter Eco dark chocolate bar, I also gave in and finally bought the blogger favorite–coconut butter. I’ve heard so many raves about it that I had to give it a try, even at $11 a jar (yes, I bought the Artisana kind). And…I love it! I know a year ago, it would have been a waste of money since I both disliked and feared coconut anything, but now that I’m pretty much obsessed with all things coconut (oil! flour! milk! shredded! bars!) I hoped I would like it. 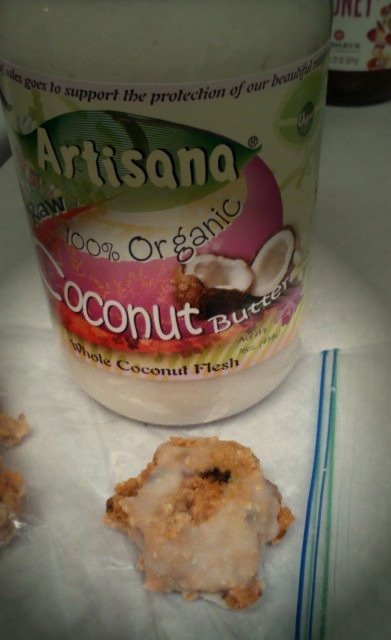 Coconut butter is amazing as a nut butter substitute, especially stuffed in dates. I can’t wait to try it out in recipes! My new finds from Sprouts and Whole Foods. You know me, always on the lookout for new, clean, vegan bars that I can try out as snacks and quick meals. I first spotted the new Larabar ALT variety on their website towards the beginning of the year, but I never saw them in stores until I shopped at a new Sprouts last Sunday. My college town has two Sprouts stores (kinda crazy considering my hometown of half a million only has one, but my tiny college town of only 150,000 has two) but I’d only been to one of them before. I was disappointed in that location’s selection of bars so I decided to check out the other Sprouts. This one is closer to me, bigger and seems to have a much better selection of everything…they even had the strawberry Zevia I’ve been looking all over for! Anyways, they also happened to carry all 4 flavors of the ALT bar so I snatched up all but the cinnamon apple crisp (I’m not a huge fan of apple-flavored things). So far, I love the pumpkin flavor and I really like that they offer 10 grams of pea protein. I like trying new things because then I can find things I love, and figure out what things I don’t like so I don’t end up wasting more money on them in the future. That’s why I like when I can find single-serve things (like the bars and Zevia) that aren’t so expensive, so if I hate them, I didn’t waste that much money. Luckily this time around, I’ve really liked everything I’ve tried so far! Do you buy new things at the store a lot, or stick with old favorites? 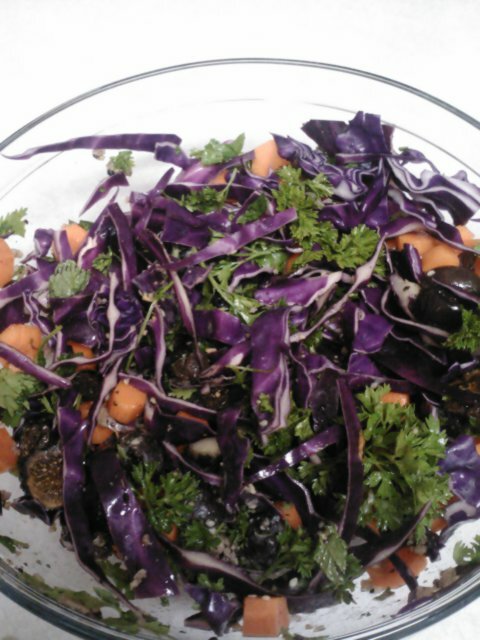 Do you like trying different varieties/colors of produce? 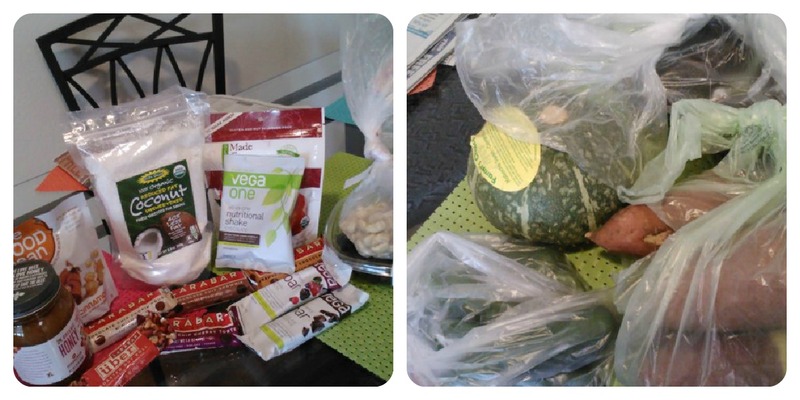 One college vegan’s mission to save money while still maintaining her clean eating standards. I’ve really been needing to reign in my spending habits lately. Between a $40 iHerb purchase last week (mostly necessary, but some were impulse buys to get the free shipping), picking up a few personal care items at Target the other day that set me back $30 (including some heavier free weights–woohoo, I’m progressing!) and going out to eat a few times with friends (not a bad things, since I need to get more comfortable with this), the last thing I needed was a giant grocery bill this weekend. And luckily, I was smart with my spending and walked away spending just over $80 for the week. This has become my new weekly goal, so let’s see if I can hit it more often than not! Verdict: Again, Sprouts can be a big money saver. The salsa was literally $1–and it’s the best $1 I’ve ever spent! They have the cheapest nothing-added dried fruit and nut selection and their produce is dirt cheap, but is just as good as anywhere else. Whole Foods haul under $55. Verdict: One of my cheapest Whole Foods trips for weekly staples ever! 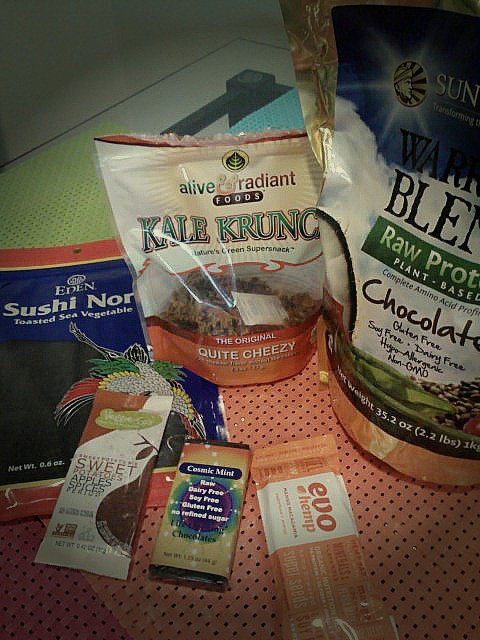 I even bought a few splurge-y items (ahem, raw desserts!) but still stayed under $60 and got a lot of things that will last awhile and stuff I needed for recipes I want to try out. What’s the best salsa you’ve ever had? What new recipes have you been trying out? A series of posts highlighting my progress in budgeting my plant-based, clean-eating grocery trips. Happy Sunday, guys! I know the East Coast is getting hit hard by Nemo, but we’re also (semi) buried in snow here in CO–so if you’re anywhere that’s gotten snow this weekend, hope you’re staying warm and safe. So you all know how obsessed I am with trying new products, right? Yeah, it’s kind of a problem. Well, not really because I’m adding more foods into my rotation and figuring out what I really love, but it can be a problem for my budget. This week, I spent a little over $100 which I’m trying not to do (my goal is $80 or under) but I actually didn’t do too much damage at Whole Foods, which is good. However, I did buy a bunch of new-to-me items, all of which I’m loving so far. Not all of them will be regulars on my lists but they’re all winners for sure. Verdict: New-to-Me Items–raw honey, Vega bars (berry flavor). Usually I can spend $30 or less at Sprouts, but the dates and honey really put me over my usual amount. Not that I’m complaining though–the honey is really good and dates are a staple in my life, and cheaper here than anywhere else. The produce was where I definitely saved a lot though. 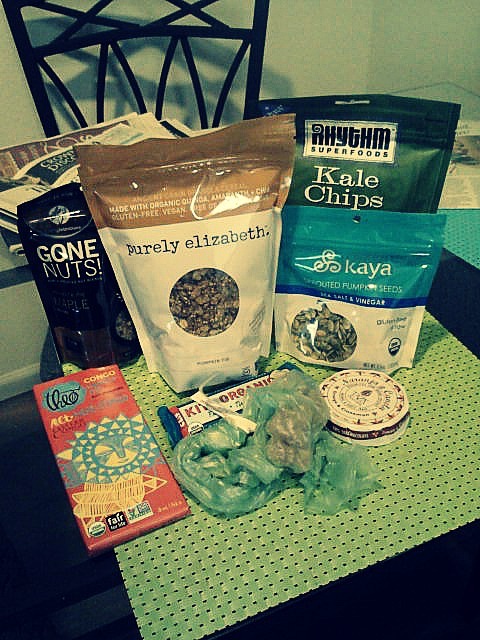 Verdict: New-t0-Me Items–granola (love that it’s only sweetened with coconut sugar and made with ancient GF grains), kale chips (mmm, but expensive), Kit’s bar (haven’t tried yet), crystallized ginger (hopefully good for when I have stomach issues), raw walnuts (also good), dark chocolate bars (when is chocolate ever bad, and the ingredients are Ashley-approved). See, I didn’t do too badly at Whole Paycheck, and that’s even with a few higher-end purchases. The kale chips won’t be a regular purchase, as I can make them easily at home, but I was feeling lazy and really wanted an easy snack. What’s something new that you’ve tried lately? Do you prefer kale chips from home or from the store? 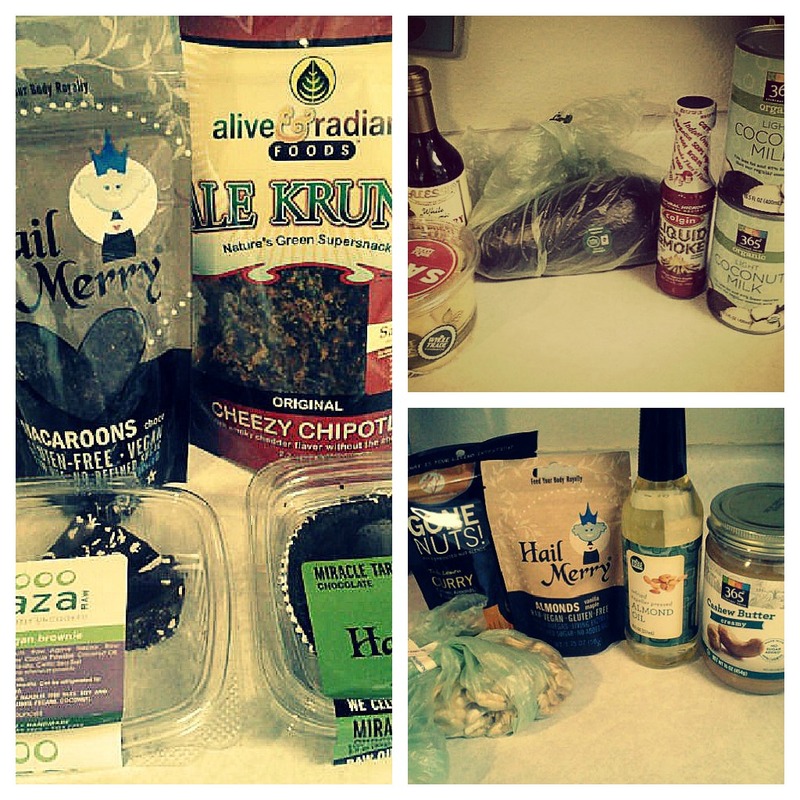 A series of posts on my adventures in buying vegan health foods as a college student. I know I said last time that I wasn’t going to be buying anything else before the end of the semester. Welllllll…that was before I ran out of nut butter and had to go without it for about a week. And I came back to no fruit other than some pomegranate seeds and frozen banana slices. Not acceptable. So I had to make a quick trip today which worked out perfectly because I had one final around noon and I headed to Whole Foods right after that. Let me just say that shopping at WF on a weekday afternoon is a lot better than going on a Saturday afternoon. Other than a shrieking baby, my trip was pretty pleasant and quick. But most importantly, I left with everything I needed…and more. Just a few WF staples to tide me over for a couple days. Verdict: I don’t really want to talk about how much I spent on the Nuttzo but it really is hard to find cheap nut butter that doesn’t have added oil or sugar (but does have a little sea salt, because it brings out the nut flavor) but everything else was pretty cheap. And the chocolate bar, rice cakes and nut butter will last a while so I’m not too worried. Do you like mixed nut/seed butters? Do you make special trips to the store if you’re running out of something you love? The latest installment in a series of posts on sticking with a college-sized budget with expensive, vegan tastes and a love for cooking. My last week of classes officially started today, and I am beyond excited to go home for Christmas break! I don’t wanna brag, but my college is giving us 5 whole weeks of break this year–usually we only get 4, so I feel really blessed. Thanksgiving break came and went too quickly so I’m planning on enjoying every moment of Christmas break. This weekend is (hopefully) the last shopping trip of the semester while I’m at school. I bought a lot of stuff, but I can bring it back with me when I go home so I’m not too worried about it. As usual, I picked up a couple new-t0-me things because, well, why the heck not? Some of the things I bought are specifically for recipes I’m planning on making so if they turn out amazing, I’ll be sure to let you know! Verdict: I’m excited to try the squash and the bread. I’ve been on the lookout for a really good sprouted bread without unnecessary ingredients (Ezekiel is okay, not my fave, and Alvarado Street is a little too processed) and I was excited to see that they sell Silver Hills bread in CO. I love their simple, whole ingredients so I’m super excited they sell it here. Now I need to look for their Little Big Bread and their gluten free breads! Verdict: I wasn’t expecting to spend this much, but then again I spent under $50 last weekend and I was running low on protein powder, which is a major chunk of the total (even with a coupon). I bought the coconut nectar because I needed more maple syrup and it was the same price for a larger amount, but I’m not sure I love it yet. I think I’ll use it in recipes, but save my beloved maple syrup for waffles and almond butter. Do you like sprouted bread? What’s the best new food find you’ve discovered lately?